Tuesday December 18th 1900 I was busy all forenoon with baking and getting the dinner. The boys worked at the corn fodder. I went up to Carries in the afternoon. I had a lot of work to do in the evening after coming home. Wednesday December 19th 1900 Will went to town this morning. I had ironing bread-baking and churning to do. I helped Ed Stockman catch and weigh 12 turkeys that we had shut up. I had a hard days work. When Will came home he said Ed Lucas was buried today. he died early Monday morning. It is a matter of regret that we did not know he was sick that we might have seen him I wrote to Mother in the evening. had a letter from her today. Thursday December 20th 1900 Will went back to Coralville today. he saw Mr OMara and bought the stalks of him. I was busy with the work all day. I did some extra washing. 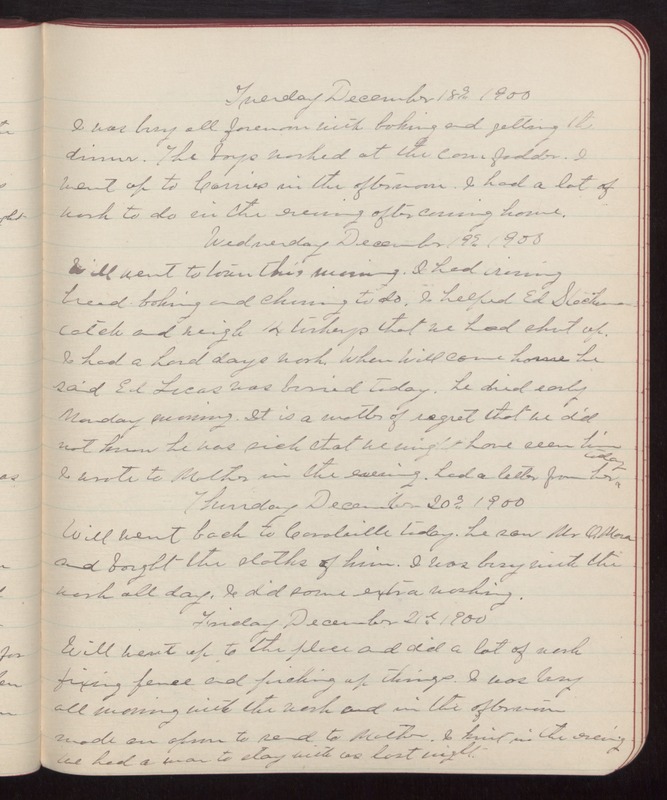 Friday December 21st 1900 Will went up to the place and did a lot of work fixing fence and picking up things. I was busy all morning with the work and in the afternoon made an apron to send to Mother. I knit in the evening We had a man to stay with us last night.